Filipinos love rice – in fact, many Filipinos could not live without rice even if there are lots of other food available during meal time. But it is also a known fact that the extra rice in restaurants can be quite pricey! 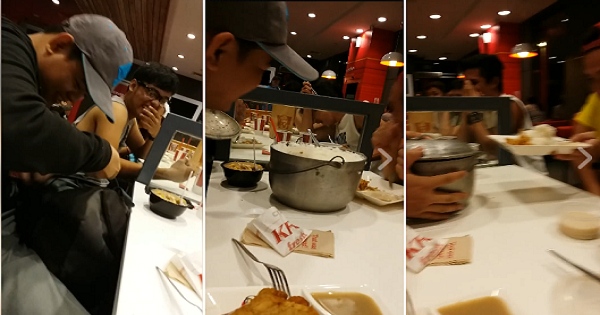 So, a group of clever barkadas (who we suspect were also actually looking for some laughs) found a solution to pricey extra rice in restaurants: bring their own rice! But for full hilarious effect, they did not just bring a cup or two of extra rice each. Instead, they brought one large ‘kaldero’ (pot) of rice! ROFL! Just as the friends ran out of rice on their plates, the designated cook took out the kaldero of rice from his backpack and distributed it to the others. This was truly a clever idea – and funny, too! To date, the video has garnered over 4.8 million views!